Come to Wrightsville Beach and let the crew at WB Diving lead you on your next epic scuba adventure. WB diving has the fastest and most comfortable 6 pack dive boat in the Carolinas! The “Ledge Tender” is a fully custom 36ft SeaTek. Her twin 450hp Cummins turbo charged engines will move you along at cruise speeds of 24-27 knots. Not only is she fast, but you will quickly notice how comfortable the ride is. Wind chop and large seas are no match for her Carolina flare and deep V. With a fully enclosed helm and seating area, there is plenty of space to stay warm and dry on the ride to and from the dive site. For a “6 pack” dive boat, she is extremely roomy and perfectly set up for offshore diving. 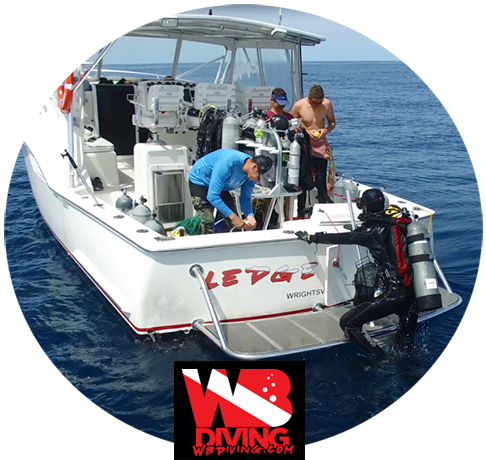 On deck, there is space for 22 tanks to ride securely and all of your dive gear fits in the custom built dive bench. Once on site, you will find that giant stride entries off of our fully custom aluminum swim platform are a breeze, and getting back on board with fins on or off is no problem with our large custom dive ladder. You will truly feel the luxury of our charters when you step below deck. Our air conditioned cabin has a queen size bed to nap on the way to and from the dive site. There are also outlets to charge all of your accessories and a microwave to heat up your lunch. A stand up head and hot water showers also make you feel right at home when your 40 miles offshore!